A lot of the health claims made for coconut water are based on its potassium content. But first, let me quickly clarify the difference between coconut water and coconut milk. Coconut milk is made by grinding up coconut meat and pressing out the liquid. Like the coconut meat itself, coconut milk is very high in fat and, therefore, calories. One cup of coconut milk contains about 550 calories, most of them from fat. Coconut water is the fluid that’s found in the cavity of the coconut when you crack it open. It contains no fat and is very low in calories, about 50 calories for one cup, most of them from natural sugars. In addition to water and sugar, coconut water also contains some minerals such as potassium and magnesium. In fact, as the websites will all tell you, coconut water has more potassium than a banana! Is Coconut Water Really That Healthy? As far as I can tell, a lot of the health claims made for coconut water are based on its potassium content. And potassium is certainly a good thing. It is involved in all kinds of essential bodily functions—and I suppose you could parlay that into a list of benefits like the one above. But virtually all fruits and vegetables are good sources of potassium. And, when you think about it, that list of benefits would apply to any diet that’s high in fruits and vegetables. People who eat the recommended amount of fruits and vegetables get about twice the recommended intake of potassium on average. And one of the advantages of getting your potassium from fruits and vegetables instead of coconut water is that you also get fiber and a whole range of other important nutrients. I’m not saying that coconut water is bad for you. But I am suggesting that if you eat a lot of fruits and vegetables, like I’m always telling you to, I’m not sure coconut water offers anything new. Should You Drink Coconut Water? Basically, coconut water is like natural Gatorade. Like Gatorade, it contains water, simple carbohydrates (or, sugar), and electrolytes (or, minerals). Compared to a sports drink made with refined sugars, artificial flavoring, and blue food coloring, I’d say coconut water represents a solid upgrade. However, the benefits of sports drinks—whether natural or artificial—tend to be somewhat oversold. Most sports drinks are consumed by people who aren’t exercising hard enough to need electrolyte replacement or benefit from additional carbohydrates. They end up consuming more calories than they’re burning. Here are my general guidelines for sports drinks: If you’re exercising very hard for more than 60 minutes, or in extremely hot conditions, a drink containing sugar and minerals can enhance your performance. Otherwise, plain water works just as well—and saves you some calories. What are some of the other claims for coconut water? Prevents dehydration. 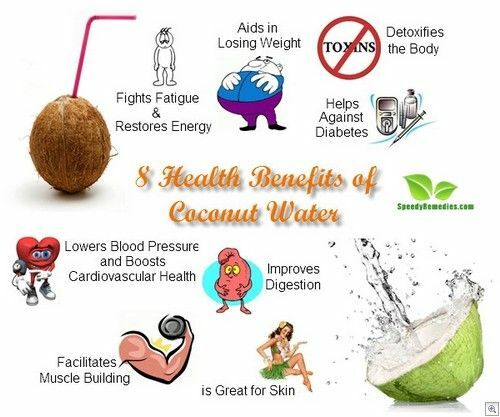 In third world countries where clean water is scarce and children regularly die from infections and dehydration, coconut water can indeed save lives. But the coconut water sold in developed countries is probably too pricey to be much help in that scenario. And among those who can afford to pay $2 for a bottle of coconut water, deaths from cholera and typhoid are fairly rare. Promotes heart health. Consuming foods or beverages rich in potassium, including coconut water, may help reduce the risk of hypertension and stroke. Promotes kidney health. Diets high in potassium, magnesium, and fluids are thought to reduce the risk of kidney stones, so it’s not surprising that coconut water is reported to help prevent or resolve kidney stones. Fights aging. Coconut water also contains compounds that seem to protect cells against aging and cancer—in test tubes anyway. It’s exciting to think that drinking coconut water could make us immune to aging and disease. But we really should know better by now. The world is chock-a-bloc with compounds that stop aging and disease in petri dishes. And yet, we don’t seem to have solved the problem of aging and disease. I think its naïve to think that coconut water is the elixir we’ve all been waiting for. At the end of the day, coconut water is a reasonably nutritious, natural beverage that appears to have health benefits similar to those available from fruits and vegetables. It doesn’t replace fruits and vegetables, but if you just like the way it tastes (or the amazing testimonials have gotten to you), there’s nothing wrong with including it your diet as well. Just remember to account for the sugar and calories it provides.